My posts to Twitter are random, at best. I downloaded Tweetdeck, but it’s heavy on memory usage and slogs down my system. Still, I’m trying to do better at tweeting. I’ve linked my blogs and my Twitter/Facebook accounts like most everybody else to save time on notifying others when there’s a new post. Makes sense for busy writers like us. Goodreads is a bit of a challenge that keeps hanging around the edges of my mind, but I need to make a note to post there at the end of each week, at least. Amazon is another venue where I need to post more regularly. I’ll make the same note as with Goodreads and do them together. I’m fooling myself, but I hesitate to write on my blog which days I’m posting. If I do that, I’ll be committing to another schedule and can feel the invisible chains called duty tightening around me. I’m working on this. I have a list of books written to date. After that I have a note against each as to what needs to be done and whether it’s on submission. I do know what I’m working on at any given time, but I also get sidetracked with non-writing activities, which leaves my project to fall by the wayside. I usually set a deadline date on when it’ll all everything done for each work-in-progress. Eg. I’ve given myself 5-6 more months to get my self-pub project completed (the writing aspect) and a cover done. I now need a third list and this is to do with interviews and blog posts. This one works in two ways. (2) The people I ask and/or those who make a request to do something on my writing blog. If I don’t keep track of the days, they go by without me realizing and when an email pops up from the person a few days prior to our D-day, I panic – mostly when it’s my turn to answer questions. Anybody ever used virtual Post it notes? I used to live by these. They can get out of hand if you’re not careful so use them sparingly and for the really important stuff you don’t want to forget. Sticky notes are also a good option that can do some cool stuff like classing them by priority and emailing them. Of course, like the lists I keep, you need to look at them once in a while. This is easy, since they’re on your desktop, but like everything else, once you get seasoned your eyes kinda pass over them without seeing them. Apart from my things to do list, I have one of those year planner thingies on the wall beside my desk. It’s something I need to use more. I think I’ll go the monthly planner route in addition to the list. I’ll post the current month and jot important stuff in the relevant date/day. You find these using MSWord. Then there’s the Pomodoro Technique, where you work in blocks of 25 minutes. With the Pomodoro Technique, you use a timer. You can buy theirs or use your own. 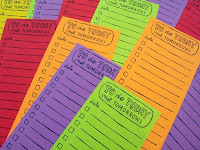 You can also write your tasks on their worksheets, which are free to download. Focus Booster is an online timer you can use to count off your 25 minutes. If you’re short on time, this is a good way to get some stuff done with a specified time limit. You can use it online or download to your computer. Now these methods may seem like an awful lot of work to keep yourself organized, but I’m sure you didn’t think this was gonna be easy. The important thing is putting a system in place. Once you get used to organizing yourself in a particular way (remember, we’re creatures of habit) your work becomes easier. The smart way is to choose something that goes along with your lifestyle and will work for you. 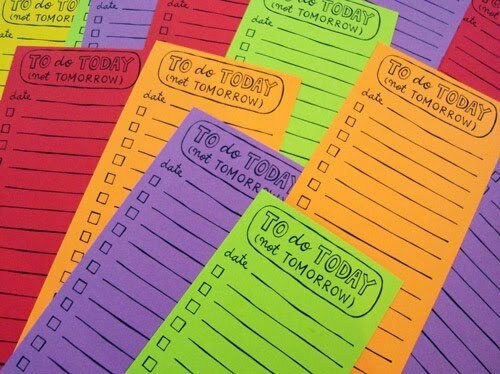 A simple ‘to do’ list might work for one person, while another prefers the sticky notes route. For me, I use a combination, but lists keep me focused and moving at a good clip. What methods to you use to keep you on track with your writing/marketing/networking? I use the online timers and google calendar. I also have a paper daytimer where I schedule everything. I really like the links. Thanks for those. Clarissa has a great point! Maybe I should start using timers et all. :P Go figure I am schooled by the post and the comments. LOL! Hope the new information is useful, Clarissa. AA, the timers do give you a better fix on what you spend time doing. Sarah, Google calendars are something I'm yet to try. I use Focus Booster, and I find it great. Must try Google calendars too. Wow, I thought I was reading about myself. Everything you said, I am going through. I'm so behind in tweeting, I'm trying but I can never seem to keep up. Goodreads, lingers as something to do but never gets done. Amazon is almost non-exist, only existing to take my money. I use to use post-it notes through my computer, I had them all over, I couldn't see my desktop on my laptop, then I had so many it started sucking my cpu's. Writing....I said I was designating Saturdays to writing...Ha....didn't happen because I did a blog hop giveaway this weekend, which took up time, which I never blog on Saturdays, so that was me trying to do too much. I feel like I need two of me. Whew...that felt good to release. Exhaling now. Christine, I'm all for trying anything that will help us get more organized. Oh, don't tell me it only gets more demanding! I thought that once I get used to blogging and figure out Tweeting, I might actually get some writing done. But Amazon? And Good reads? My head is swirling. And I keep forgetting about good old Facebook. I've been negligent at keeping up with that lately. Sheesh! And double sheesh! You've got the right idea. I'm in the planning stage--planning to get organized, make lists, draw up schedules. My current life seems so chaotic at times that each day seems over before I have time to plan for future ones. I just need to get busy and do it! Lyn, yes, it does get demanding but I aim to have a bit more control than I do now. Arlee, thanks for dropping in. That's the idea. Taking the bull by the horn and organizing the jobs that need to get done. I forget about the schedules which I created myself, so I'm going to check this post it and sticky notes you mentioned! Thanks!